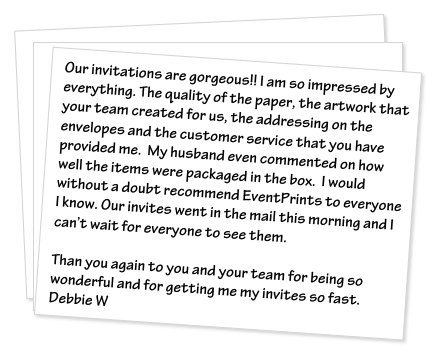 Read what others have said about ordering from EventPrints. It's the new and better way to buy invitations! Our invitation was gorgeous. Some invitees have commented back that they have never seen an invitation as beautiful. I also can’t tell you enough about the wonderful professionalism of your staff—Kellie, Melissa and everyone else with whom I interacted-- were an absolute pleasure and incredibly patient, helpful and knowledgeable; and I will recommend you all highly whenever I can. We just opened our invitations...they are even prettier than we expected! Thank you very much. It was a pleasure working with you. I'd be happy to recommend your service.Thanks again! Thank you to Kellie and the proofing department for their expertise, a ton of patience, and beautiful work!! We love the invitations!!! Thank you for holding my hand every step of the way! I will definitely recommend you!!! I used EventPrints for my daughters Bat Mitzvah invitations and Kellie my representative was fantastic! The invitations were incredible, and everyone complimented us on them. EventPrints were a pleasure to deal with throughout every single step. Even when I forgot the table assignment card they were able to work with me and use the same card stock that matched our original invitations so we could keep with our theme. I can't thank Kellie and the staff enough! they made a special day even more special! Oh my, oh my...the invitations are beautiful!!! They exceeded my expectation! Thank you so, so, so much for all your help and patience creating and ordering them. I appreciate you and everyone that worked on them - such a labor of love. Just got my invitations for my son's Bar Mitzvah. They came out absolutely incredible! Everything from the envelopes, printing, invite, RSVP card looks even better than I had imagined. So glad I decided to go with EventPrints. I saved some money and got an invitation that was just as nice, if not nicer, than I would have gotten going through a middle man and having to look through tons of books, in hopes of finding something that I liked, within my budget. Their service is so personalized. Kellie helped me through the whole process and everything came out just perfect! HIGHLY RECOMMEND! Thank you, thank you, thank you! The invitations arrived today and Jordyn and I were so thrilled. The invitations look absolutely beautiful and you and the team were a pleasure to work with... the quality of the invitation, the professionalism of the staff and how easy you made it all. Thanks again for all your help and the beautiful invitations you created for our daughter. I highly recommend EventPrints. The team at EventPrints could not have made this any easier and I was able to do it all online through email. The team there was extremely responsive and helpful in crafting my invitations - they even provided custom design advice without the custom price tag! I was so thrilled with how the invites came out and I got a ton of compliments! I was hesitant to pick out invites online but they came in even better than expected! Just wanted to reach out to say how happy we are with the invitations that we ordered for our daughter's bat mitzvah. The quality of the invitations is excellent and we are very happy with the customer service and overall experience! Your hand-written thank you note capped it off nicely. Great job to you and your company! I just mailed the invitations this morning and wanted to send you an email to let you know how great it was to work with you and EventPrints. The invitations are such a nice quality and I thank you for your feedback as we talked through the design. Our daughter loves them and can't wait to see those RSVP cards come back! My daughter screamed with joy. I wanted to tell you how much I LOVE our invitations!!! They are simply spectacular. We mailed them a few days ago and it’s been so much fun hearing the reactions. They’re breathtaking. I can’t thank you enough for your patience with me and guidance. I will be recommending you to friends and hope to work with you again! I just want to thank you for the amazing invitation you created for Max's Bar Mitzvah. I got so many phone calls from guests just telling me how much they loved the invitation. Words like "classic" "unique" and "nothing I have ever seen before " were used by many family and friends. In addition to a great invitation, working with you guys was truly a great experience. Your customer service was top notch; the way every company should be run. Thanks so much again for everything!! I just wanted to send a quick note to let you know that our invitations came out AMAZING!!! The colors, the quality of the paper and the modern vibe.... they are so special. They’ve gone out and we have been getting such a warm response from our guests. Thank you to EventPrints for making this such an easy and seamless experience. It really was a pleasure to work with all of you! I just wanted to let you know that the box arrived last night and my daughter, husband, and I were truly OVERJOYED to see the lovely invitations, reply cards, addressed envelopes, paper, etc. The quality of the finished product is absolutely lovely! Thank you for your hard work and the wonderful customer service. We look forward to sending more business your way…. Thank you so much for helping to make our Bat Mitzvah a success! We were so happy with everything and you helped make it that way. It was a pleasure working with you and we look forward to working with you again on future events. I want to tell all of you how very much we appreciate and applaud EventPrints and the role each of you played in our Fall Fair signage. Thank you so very much for all you did to accommodate our needs and deliver to us pieces that are perfect! I absolutely LOVE Mara's invitations. She is so happy, and that makes me happy! You were so easy to work with, I'd recommend you to anyone who asks. I just want to say thank you again for all your help with the save the dates and invitations for the wedding. They turned out really great and we got so many compliments on them! I also just saw the stickers y'all made for the gift bags - they're great too! Thank you. am so happy I found you. For sure, I will keep your business cards and order invitations cards for some events. Thank you for all your assistance during this process ! I must say the system you have in place for the corrections and proofs is really great and so organized. Thanks again, it is such a joy to work with you and the design team. Your design team did an amazing job! Loved working with you; you're so talented and professional :-). I can’t begin to tell you what a hit Madeline’s invitations are! They dropped this week and the compliments about the design, the look, the quality have been overwhelming from all of our guests! Really gorgeous and we couldn’t be happier! Thank you. I just wanted to take a minute to thank you for such a great experience putting together the invitations for Matthew's Bar Mitzvah. The entire process from beginning to end was easy and flawless. Thank you for all of your help through the process. The invitations look beautiful, and turned out exactly how I wanted. Thank you again for a great experience! I worked with Sarah and the EventPrints team to order our wedding invites. Throughout the whole process they were able to answer any questions I had and ensured everything was accurate. They were really helpful in coming up with customizations and assisting with my order. I especially liked receiving hand written notes from Sarah. It made the whole process feel personal and unique. I just wanted to let you and everyone at EventPrints know that I have gotten so, so many compliments on our invitations. We, of course, were thrilled, but it has been nice to hear so many people liked them as well. I wanted to tell you that the invitations have been received with rave reviews. They really are so unique. We are very happy. Thank you so much for all of your help in making these beautiful invitations. Everything came out perfectly. I will definitely recommend your company to other people. Thanks again for all your help. Mark, Erica, Stacy and I arrived home last night to a stack of mail and an absolutely stunning invitation to Erica's shower! We love it and are so excited!! Just wanted to thank you and your team for doing such a fabulous job with both product and customer service. I genuinely appreciate everything. Everything looks great. Thank you so much for all of your help!!! WOW!!! I love it!! Thank you so much for creating such a beautiful invitation for my son. You really captured all the details that I outlined on the personalization form and were able to accommodate all of my requests. FANTASTIC job! Just wanted to tell you how much I appreciate all your help during Terry’s Bat Mitzvah. You are appreciated. We got the beautiful invitations in the mail yesterday and we LOVE THEM! Thank you so so so so much! We've already gotten a lot of compliments on them and can't thank you enough for your attention to detail, patience, and hard work! I can't say enough about your staff's work ethic and commitment to customer service. They not only met my expectations, but exceeded them. It's rare to find a person that sees the big picture while still paying attention to small details. I just wanted to let you know that the invitations came out great! I love them! You guys did a great job. I absolutely love the invitations. The colors are so fantastic and they are really beautiful. It's been a pleasure to work with you and your company. Everything was smooth and easy and you guys kept to your timeframes every step of the way. I will highly recommend you guys. The invites have gotten tremendous praise! Everyone loves them! Thanks! Thank you so much for everything. We just received Emily's invitation suite. We are thrilled with the final product. Thanks you and your team so much for all of your help and support. It has been a pleasure working with you. Just received our invitations.They Are so beautiful! My cousin is planning on using you, too, and was impressed at the selection on your site... last time we talked I heard her daughter saying “Mom look at this one it’s so cool"! And they are!! Can’t wait to get them in the mail! It was a great experience working with your company. My daughter lovers the invites! We just received our invitations. We love them and are very excited to send them out soon. They are truly beautiful and unique.